The Oriental cockroach is shiny and very dark (almost black) in color and sometimes called a “black beetle” or “water bug” because of its preference for areas of moisture such as water heaters, drains, leaking pipes and sewers. Despite the “water bug” name, the Oriental cockroach is not a true water bug. Adult male oriental cockroaches have wings, but cannot fly. Oriental Cockroaches live close to the ground in damp areas and can be seen crawling out of cracks in foundations and traveling along concrete seams. In residential neighborhoods, Oriental cockroaches can be found outside under rocks and organic matter, such as leaf piles and mulch. This species of cockroach will feed on most anything, but typically prefers garbage, sewage and decaying organic materials. Cockroaches can carry up to 33 different types of bacteria as well as parasitic worms and human pathogens. Because Oriental cockroaches survive on filth and travel through sewer systems, they can easily spread the above health threats when they travel across decaying matter and trash and pick up bacteria and pathogens on their bodies and then spread them to food surfaces. Oriental cockroaches are mostly found outdoors in damp shady locations but can be introduced into a structure through cardboard boxes, water pipes, and through improperly sealed door thresholds. Even though their natural habitat is outdoors, Oriental cockroaches are numerous in warm summer weather conditions and can make their way inside a structure looking for food and water sources. A female Oriental cockroach can produce an average of eight egg cases (ootheca) throughout its lifetime and deposits about one ootheca per week. Each egg case contains 16-18 eggs and is deposited or glued near sources of water or food. Since one pregnant female can produce 16-18 nymphs a week, an Oriental cockroach infestation can be underway in just a matter of a few short weeks. AmeriGuard Pest Defense will perform a thorough visual inspection to identify the severity of your Oriental cockroach problem. During the inspection, all sources of the infestation will be identified and methods of cockroach treatment will be discussed. The technician will also point out potential Oriental cockroach harborages and suggest mechanical methods of cockroach control. A successful cockroach control service depends on the cooperation of our customers. What Can You Do to Get Rid of Outdoor Roaches? Dispose of trash regularly and keep trash receptacles clean and tightly sealed. Keep kitchen areas clean of crumbs and keep food tightly sealed. Clean behind appliances such as stoves and refrigerators regularly. Eliminate damp conditions by reducing exterior irrigation and other sources of moisture. Make sure that subareas beneath homes with raised foundations are properly ventilated. Reduce harborage sites by keeping shrubs trimmed and reducing mulch depths to less than 2 inches. Seal small openings around the structure, including around utility pipes. Door thresholds and window seals should be properly fitted to prevent cockroaches from gaining access inside. Contact your pest professionals at AmeriGuard Pest Defense as soon as you see evidence of Oriental cockroaches. For every cockroach you see, there are several others that you do not. 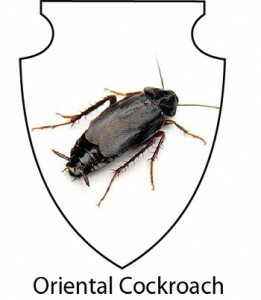 Contact your Oriental cockroach service experts at AmeriGuard Pest Defense for an outdoor cockroach treatment quote. Most quotes for outdoor cockroach services can be provided over the phone without any obligation. A General Pest Control Maintenance Program will include outdoor cricket control on an ongoing basis. No contracts required! Call AmeriGuard Pest Defense at (951) 652-0505 for more information on getting rid of roaches or submit a request by clicking the Contact Us button below and someone will get back to you to discuss your cockroach control needs. Oriental cockroaches are considered a General Pest, which are covered under a Monthly or Bi-Monthly Pest Control Service.